MAID. O, welcome, Heracles! come in, sweetheart. Made rolls and honey-cakes. So come along. I’ll admit, I sometimes have odd cravings. Raw carrots, candy hearts, frozen peas… the list goes on.1 But earlier this week, after consuming some mediocre lentil soup at a mediocre falafel joint in my neighborhood, all I could think about was lentils. 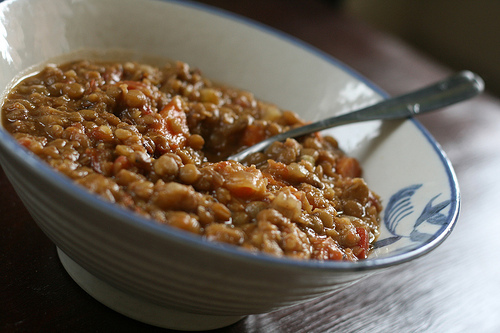 In a lentil-induced haze, I ran to my local supermarket and bought a handful of ingredients: carrots, celery, tomatoes, onion, garlic, and–you guessed it–lentils. After two hours of chopping, sautéeing, ransacking my spice cabinet, sprinkling, simmering, and stirring, something new and delicious was born. Chop the carrots, celery, and onion. I like big chunks of onion and carrot in my soup, but your mileage may vary. Chop according to personal preference. Mince the garlic. 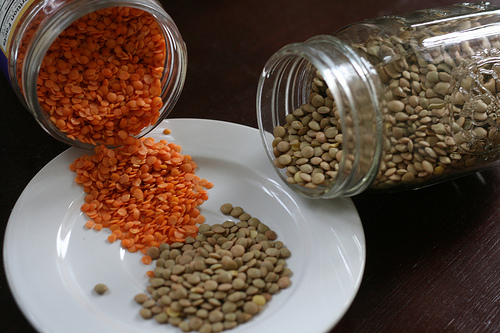 Soak the lentils7 in a bowl of warm water (make sure they’re covered by at least an inch or two of water) and set aside. Pour/make your vegetable stock in a large pot. Sauté the onions in olive oil with a pinch of black pepper for a couple of minutes until almost cooked. Sprinkle in about 1/2 tsp of paprika and 1/2 tsp cumin. Add the carrots, celery, and garlic and continue to sauté for 10 minutes. (You may have to splash in a little more olive oil.) Set aside. At this point, your lentils should be a little puffier, though not completely expanded.8 Drain them and pour into the vegetable stock. Stir in the rest of the vegetables. Add the rest of your spices. Bring to a boil, then reduce to medium-low heat and simmer, covered, for at least an hour. Serve with a good, crusty bread. This recipe fed two very hungry people completely, plus three servings left over for lunches. It is deceptively filling, and doubling the recipe should easily feed a whole dinner party of six. Or many tiny children. Next PostThere’s no crying in cycling! I;ve never had success with lentils. They never seem to cook throughout. Maybe I should try again.